Perfect make ahead "feed a crowd" game day/tailgate stuffed sandwich! This large sandwich is layered in a round loaf of bread. 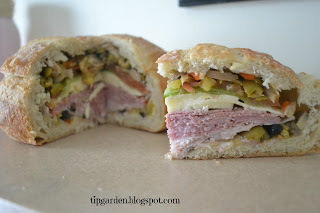 It is similar to a muffuletta, but can easily be adapted to suit your own taste! I love that it is made the day before and refrigerated overnight, so is perfect to make ahead of one of your ultra busy days. Feel free to play around with the ingredients! 2) Cut the top half of the bread off. 4) Spoon 2/3rds of the Olive mixture into the bottom of the bread. 5) Layer turkey ham and salami on top of the olive mixture. Press down on layers as you go. 6) Layer the cheese on top of meats. 7) Layer the lettuce /tomato slices on top of cheese. Press down firmly on sandwich. 8) either on top of the tomatoes or into the hollowed out top bread (I filled the top bread), layer the remaining olive mixture. Place top on bread and press down firmly. 9) Wrap in plastic wrap and refrigerate overnight. 10) Slice into wedges to serve.